Moments after leaving Martha Jones on present-day Earth, the TARDIS collides with the bow of the Titanic. The Doctor quickly realises that this isn’t the infamous doomed ocean liner, but rather a starship operated by an alien cruise line, which is currently enjoying a voyage to Earth to experience the Christmas holiday. 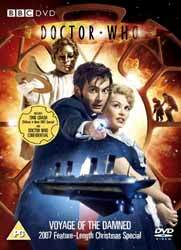 On board, the Doctor meets a waitress called Astrid Peth. Together they must battle against saboteurs and robotic angels armed with killer halos in an attempt to divert the Titanic’s collision course with Earth. It’s a race against time as the Doctor and Astrid lead a small, brave and strange band of survivors through the devastated vessel. Can the Doctor get them all to safety in time...? Voyage of the Damned is my least favourite Doctor Who Christmas special to date, and I’ve been trying to work out why. Part of me feels that I ought to prefer the relatively coherent plot of this 70-minute episode to the structurally flawed The Christmas Invasion (in which the sinister Santas and killer Christmas tree seem merely grafted on in order to provide the yuletide theme and extend what could have been a regular-length episode to one hour) and the frequently nonsensical The Runaway Bride (with its over-elaborate villain’s scheme, all that confusing business about Huon particles, and a bore hole to the centre of the Earth that manages not to cause a catastrophic eruption of lava, not to mention Stahlman’s gas). In their favour, however, The Christmas Invasion and The Runaway Bride boast endearing or at the very least memorable characters such as Jackie Tyler, Mickey Smith, Harriet Jones and Donna Noble. The best that Voyage of the Damned can offer us in this regard is the conker-headed Bannakaffalatta (Jimmy Vee) and a cameo appearance by Bernard Cribbins as a world-weary newspaper seller (thank goodness he’s coming back in Series 4). Kylie Minogue gives a decent performance as Astrid, who is very much a companion that could have been, but the role itself is surprisingly “unstarry”. Russell T Davies’s story can hardly be described as original. I don’t mind the homage to disaster movies such as Titanic and The Poseidon Adventure. Doctor Who has a long history of borrowing from classic and/or popular works of fiction. Nor do I mind (quite the opposite, I quite like) the jokey off-the-cuff references to narratives as diverse as Max Headroom, Passenger 57 and The Apprentice. However, instead of the killer robot Santas from the last two Christmas specials, what do we get? Killer robot angels! In appearance and action, the Hosts are rip-offs of the deadly servitors from The Robots of Death, with their deceptively pleasant faces and voices, their repeated vows to “Kill... kill...” and their habit of removing one hand when it gets stuck in a door. The effects are good, and, though I initially didn’t like Murray Gold’s souped-up new arrangement of the theme music, but it’s beginning to grow on me. Other than that, it’s sad to say, but my favourite part of Voyage of the Damned is the teaser for Series 4 at the end. However, this is not an entirely damning review, because this DVD also contains a couple of nice special features. There’s a 15-minute Doctor Who Confidential covering the making of the Christmas special - but best of all is the Children in Need mini-episode, Time Crash, guest-starring Peter Davison as the Fifth Doctor, who meets David Tennant as the Tenth. Short and sweet, Time Crash contains numerous nods and winks to the eras of both Doctors, and, for the first time, provides a canonical explanation for why returning actors appear visibly older whenever they return in multi-Doctor stories (though it doesn’t explain why they never seem to remember the events of such encounters with future selves, as the Doctor so crucially does here). I would say that Davison steps effortlessly back into the role as though he’d never left it (which was also true of his appearance in Dimensions in Time), but then he’s been reprising the role for Big Finish Productions since 1999, so he’s well and truly kept his hand in (Tristan Farnon pun not intended). Writer Steven Moffat’s reverence for the Fifth Doctor is a little sycophantic, but who can blame him? Davison was my Doctor too. If it weren’t for Time Crash, I would be giving this disc a significantly lower mark out of ten.